Manchester United seem to have turned a corner after their shaky start to the season by getting back to back wins against Burnley and high-flying Watford. One thing that was common in both these wins was that Man United's gritty bit of defending was back in work. Much of this was due to the presence of the towering Belgian midfielder. It was hugely evident in pre-season that Jose Mourinho wanted a new Centre Back. Even though the club has four experienced players in the position, none of them have seemed particularly consistent in the years gone by. The club's inability to bring in a reinforcement was deemed a huge failure even before the season began. It was then evident from the opening games, with United leaking goals left and right. This is in high contrast with the team's showing last season when they had the second-best defense in the league. Jose's teams are built upon their defensive solidarity. When the defense fails, his entire game plan crumbles. You rarely expect a Mourinho side to outscore their opposition. In stepped Marouane Fellaini. Usually, a figure of ridicule and unjustifiably rarely taken seriously for his footballing skills, the Belgian has actually been a key figure for both club and country for years. 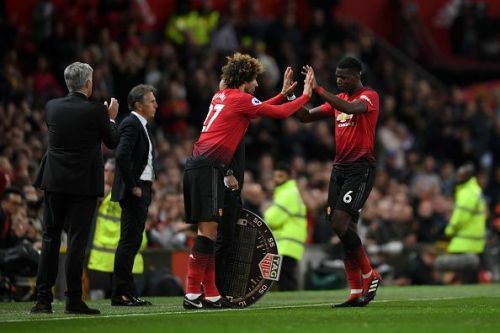 When utilized properly, Fellaini has the ability to turn games by himself via his unique qualities. His introduction against Japan in the round of sixteen of the World Cup paved the way for a Belgian comeback, at a time when a team filled with superstars such as Eden Hazard and Kevin De Bruyne was looking devoid of ideas. 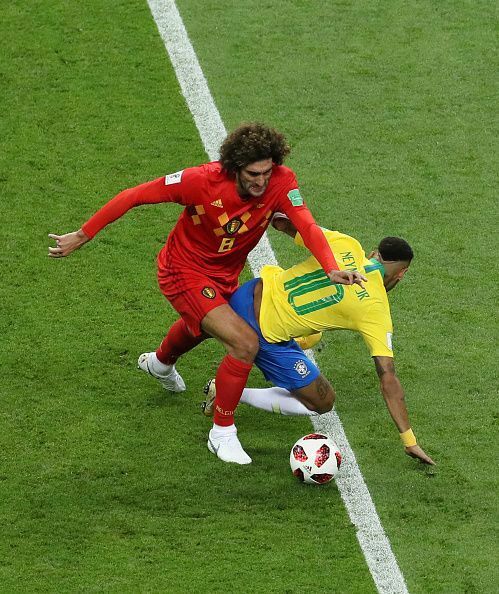 The next match, he played a totally different game- keeping Neymar quiet on and off the ball. What makes him such a game changer- something that majority of the footballing world fails to see? After making an only brief substitution in the start of the season- he has started the last two games and United have looked a much-steadier team in his presence. He has dislodged Nemanja Matic as the deepest playing midfielder in the side, sometimes dropping back as a third Centre back. This has helped steady a very shaky United's defensive pairing. While also allowing Paul Pogba to head further up the field and giving Matic some much-needed assistance as the sole ball winner in the side. His most telling contribution, as expected, is winning aerial balls. His total of 21 aerial wins is way ahead of anyone else in the side. Man United's second goal against Watford came up with him winning the initial cross which Chris Smalling then converted. United have won both the games that Fellaini has started in this season. Fellaini also likes to keep the passing simple deep in midfield- something that Mourinho prefers. Risky ballplayers such as Pereira, Fred and Herrera would hence, fall behind the pecking order. Fellaini's passing statistics are impressive with him playing 127 accurate short passes as of yet. Jose Mourinho has stated that due to the lack of reinforcements, the team has to work with the players that they have, playing to his group's strengths. Fellaini is crucial in this regard. His versatility and usefulness in defense as well as in attack lay an opportunity to get a much-needed balance in the side. Mourinho can then deploy his preferred tactics up front. 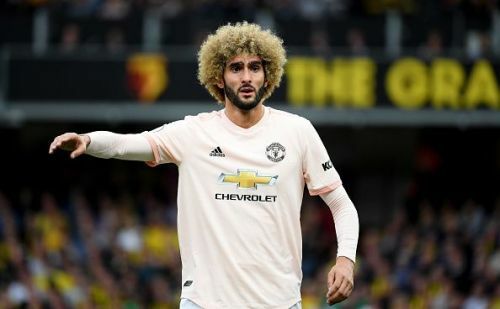 Fellaini looks to be the answer to Man United's current defensive woes, something that Jose Mourinho himself has stated after the Watford win. Until the club gets another quality center back or the current ones step up, expect him to continue playing in the current position. While the Belgian will also continue to be the customary plan B outlet when the team needs a goal and they decide to go long. While players like Luke Shaw, Pogba and Lukaku are crucial for the team. They could only perform to their potential if the team functions well as a whole. Fellaini might just be the most important player for Man United this season in that regard. Did Manchester United commit a mistake by selling Marouane Fellaini?